The Call for Proposals for the 2019 Annual Conference has closed. The Association of International Education Administrators (AIEA) invites the submission of proposals for its 2019 conference at the San Francisco Marriott Marquis. Pre-conference workshops will be held January 20-21. The conference will begin in the afternoon of January 21 and end in the afternoon of January 23. Please note that session presenters are required to register for the conference. We recommend taking advantage of early registration for discounted rates. What's Next? Possibilities and Probabilities in the Future of International Higher Education. Details about the Theme and Subthemes are available at the AIEA webpage. Report from the AIEA Strategic Issues committee: Strategic Issues: Summary, Analysis, and Priorities Facing International Education Leaders Today (.pdf). Panels are 60 minutes long and may include a maximum of 3 presenters (either a presenting chair and up to two other presenters; or a non-presenting chair and up to three other presenters). A minimum of 20 minutes of interactive dialogue with session attendees is required. Feedback from previous AIEA conference attendees has shown that the most successful sessions are those that exhibit the spirit of genuine and collegial discussion and exchange of ideas. Roundtables are 60 minutes long, focused on specific topics, and presented/organized by a maximum of 2 facilitators (either chair and one other facilitator, or a non-facilitating chair and two co-facilitators) The idea of the roundtables is to delve into the deeper issues of particular topics and focus on developing solutions, approaches, strategies, or innovative thinking. They demand interaction from all participants. Facilitators briefly introduce the topic and provide background information (note that this should not be a presentation and should not involve a slideshow), then pose questions to facilitate the discussion. The outcome of each roundtable session is a collegial discussion and an exchange of ideas providing a range of perspectives and take-aways for participants. Facilitators are requested to submit the discussion outcomes in writing to AIEA for posting on the conference website within two weeks of the conference. Determine and indicate the type of session format for which you are submitting a proposal: 1. a panel session or 2. a facilitated roundtable discussion. Panel Session Proposals must demonstrate that at least 30 minutes are incorporated for discussion and interaction with participants. Panels should not be “talking heads” but rather allow sufficient time for adequate discussion and exchange between all in attendance. Panel Sessions should focus on lessons learned, challenges and issues encountered, and how those were addressed. Sessions should not be a “show and tell” of a university or a program. Presenters are requested to keep details or case studies from specific universities or programs to a minimum; these can illustrate points but should NOT be the focus of sessions. Facilitated Roundtable Discussions should pose a series of discussion questions and should NOT include any formal presentations or a slideshow. Target audience is specifically university leaders and sessions should focus at the strategic leadership level. AIEA will give preference to sessions that include multiple institutions and diverse perspectives. Student perspectives are most welcome. The purpose of the conference is to help leaders at higher education institutions (and in the world of international education at large) carry out their responsibilities and develop new ideas for internationalization. Sponsorship opportunities exist for those with services, programs or products available on the market to assist in this effort, but these services and products are not acceptable topics for sessions. We will NOT accept proposals that promote a product, program, university, or service. Sessions that focus on one institution and sessions that are not targeted towards a senior international officer audience will not be accepted. Content outline describing the major theme(s), challenges, lessons learned, successes and failures, application possibilities for other institutions, etc. that will be addressed in this session. In addition, please include the goals of the session, take-aways for leaders, and the methodologies to be used in the session. Remember to include a minimum of 30 minutes for discussion in the panel discussion format session. If there is more than one presenter, explain what each presenter will discuss. Please be as complete as possible and remember that the content needs to have wide applicability, comparative perspectives and an analysis of "lessons learned" useful to higher education leaders. Facilitated Roundtable sessions must describe the topic in detail, the questions posed to participants, and desired outcomes. It should be clear from the description that there is no formal presentation or slideshow planned. For the Facilitated Roundtable sessions, explain what each presenter will discuss, how the discussion will be moderated, expected outcomes and how outcomes will be collected and distributed. You are also asked to state learning objectives for the session in 50 words or less. Note: The proposal form is also available as a Word document (.docx) for proposal planning purposes, however, only proposals sent through the Catalyst system will be considered for the 2019 Conference. Please pay very careful attention to the exact format, language and word limitation required: no more than 75 words for the abstract and for the bios. Biographies may include presenters’ positions and major work accomplishments relevant to the presenter’s session topic. They must be formatted based on the sample biographies provided. The biography should be written in the third person, and consist of full sentences. Important: Please observe the sample bio format provided. Proposals submitted without an abstract, full description, or complete and correctly formatted bio information on all presenters listed will not be considered. Presenters may not present in any more than three sessions. The Conference Committee reserves the right to recommend a different session format, combine sessions, and schedule sessions. Scheduled session times may not be changed. Proposals must be targeted to university leadership. AIEA uses the Catalyst system for proposal submission and review. If you submitted a proposal or reviewed proposals for the 2018 AIEA Annual Conference, you already have an account created and will need to log-in using last year's credentials (or re-setting your login by clicking on "Forgot Password" at the log-on page and entering your email address). If you have not created a Catalyst account in the past, you will need to create an account. NOTE: Please do not hesitate to use the “support” button at the top left on the collection site for any technical questions. This “support” link will be the quickest and most efficient way to resolve technical issues. You may also refer to this step-by-step page with detailed instructions. Be sure to save a copy of the proposal, as well as your reference number, before submitting it to AIEA! Once you have successfully completed your submission, you will receive a confirmation email. If you do not receive a confirmation email, please use the Support link located at the top of the site. Your confirmation email will also appear in your dashboard when you log in the system. After you finish reading the overview thoroughly, use the provided link to create an account. Once your account is created, you will automatically be taken to a new session proposal. (If this is not the case, please click the “support” link at the top of the page, or follow these instructions. Be sure to have all information ready to enter, including an abstract (75 words), a session outline and description (500 words), chair and presenter bios (75 words) and contact information, and other information. At the bottom of each page, click “Next” to continue to the next section and click “Save” to save any information entered throughout the form. If you click “Save” and there is incomplete information, you will receive an error symbols on the form indicating which sections are missing or are not meeting the criteria set within that field. The best practice is to click “Save” on every page so you can see the errors on that specific page. If you wait until the end to click “Save,” you will still receive the error message, but you will need to navigate back to the page the error is on. At the end of the form, click “Submit” to officially submit your proposal. You will know your submission was successful when you receive an electronic acknowledgement. If this acknowledgement is not received, please return to your Dashboard and review your incomplete submission(s) within your profile. At the confirmation page after submitting, a link is provided to submit another proposal. From your Dashboard, go to Submissions. You should see "+ Create Submission" to the right of the event name. If you encounter technical difficulties, please use the Support link at the top of the site. Note again that sessions should not promote marketed products, programs, universities or services in any way. We will NOT accept proposals that promote a product, program, university, or service. Sponsorship opportunities exist for those with services, programs or products available on the market to assist in this effort, but these services, programs, and products are not acceptable topics for sessions. The Conference Committee will have to choose among many proposals, some of which may be similar, and will seek balance among topics and areas of importance to the membership. Proposals of equal merit cannot in all instances be selected when the result would be an imbalance in the conference’s overall coverage of topics, audiences, and regions. Please also note that proposers may be asked to collaborate with others who have proposed a similar session on a combined session, or to change session format. You will hear by early October, if not sooner, regarding the status of your proposal. Members of the conference advisory committee will review proposals. There are at least three readers for each proposal. Can I add an additional presenter or facilitator to my session? Why are the numbers of presenters or facilitators limited? 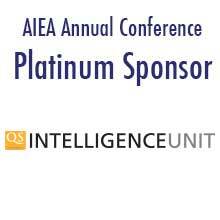 AIEA conferences are unique in that participants are senior leaders in international education. To capitalize on the collective knowledge of conference participants, sessions are required to have at least 30 minutes of discussion (standard/panel sessions), and roundtable discussions are discussion-based. Because of this, sessions are limited to three presenters (including the chair) and roundtable discussions limited to one chair and a second facilitator. If additional insight is helpful to the session, others are welcome to participate in the discussion portion of sessions as participants but will not be listed in the conference program or mobile app. No, due to the complexities in conference scheduling, AIEA is unfortunately unable to accommodate specific requests for session scheduling. Sessions will be scheduled between noon on Monday, January 20 and 1:00 p.m. on Wednesday, January 23. Please make sure you and your co-presenters/facilitators are available during this time frame. If selected, session chairs will be notified of the session date and time by December. No, there is no discount in conference registration fees for presenters. We recommend that presenters register early to take advantage of early discounts. Details are available at www.aieaworld.org. Yes, you will need to provide your own laptop, and Mac users should bring appropriate adapter cables. Note that roundtable sessions should not involve any formal presentations, and projectors may not be available. What are the A/V materials provided to presenters? Standard/Panel sessions will be in theater-style seating with a projector and screen available. Presenters should be prepared to bring their own laptop and any necessary adapter cables (particularly Mac users). Roundtable discussions are facilitated discussion-based sessions without a formal presentation, so presenters should not have a PowerPoint. Participants will be seated at roundtables. One microphone will be provided in rooms large enough to need this; AIEA is unable to accommodate requests for additional microphones. Can a presenter call in or present over Skype? Can I play a video during the session? While there is limited wifi available at the conference, the speeds are not high enough to support streaming video or Skype/VOIP calls. For that reason, chairs should not depend on having a presenter call or Skype into a session. All videos should be saved to presenters' computers. Please contact: AIEA Secretariat: [email protected] — Telephone: (1) 919 893-4980. Please utilize the Support link at the top of the page. A tech advisor will contact you within 24 hours, during normal business hours, 8 AM to 5 PM Central Time, Monday through Friday, excluding US holidays. Questions sent after 5 PM Friday will be answered on the following Monday. We highly encourage this method of communication as we can track which site you are submitting on. This will speed up any technical diagnostics we need to run before solving the issues.